Los Angeles! A night of storytelling awaits. You are invited to check out the latest edition of Disoriented Comedy's Family Reunion. The monthly storytelling show, co-presented by Angry Asian Man, Tuesday Night Project, Mishthi Music and KAYA Press, features regular everyday folks talking story. No notes. Good times. The theme of this month's show, co-presented by National Asian Pacific American Woman's Forum Los Angeles, is "Where Are You REALLY From?" 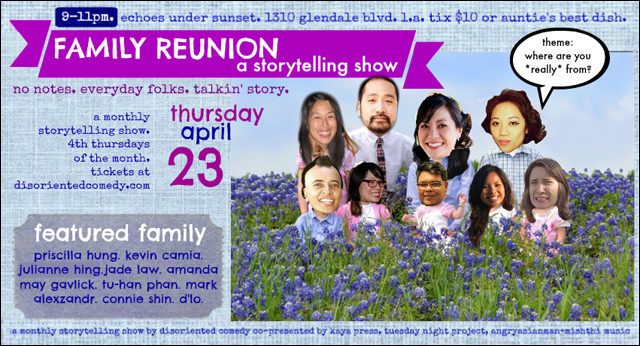 and features storytellers Mark Alexzandr, Amanda May Gavlick, Kevin Camia, Jade Law, Connie Shin, Priscilla Hung, Tu-han Phan and host D'Lo. This ought to be a good one. If you haven't made it out to one of these storytelling shows, it's a blast. For further details about Family Reunion, check out the Facebook event. To purchase tickets, go here.